Above: A couple walks on Marginal Street in Boston, Tuesday, March 13, 2018, amid snowfall from Winter Storm Skylar. Image credit: AP Photo/Michael Dwyer. A sprawling winter storm—the third in a punishing two-week series—dumped prodigious amounts of snow across much of New England on Tuesday. Blizzard warnings were hoisted for areas along and near a stretch of Atlantic coastline from southeast Massachusetts to the eastern tip of Maine, including the Boston and Portland metro areas. Snowfall totals of one to two feet were widespread over a broad swath of eastern New England, with amounts topping 2 feet beneath the heaviest snow bands. See updated snow totals below. The storm’s surface low, positioned well offshore, qualified as a meteorological bomb or “bomb cyclone,” as its surface pressure dropped more than 24 millibars in the 24 hours leading up to Tuesday morning; the central pressure was 972 mb at 12Z (8am EDT) Tuesday morning. 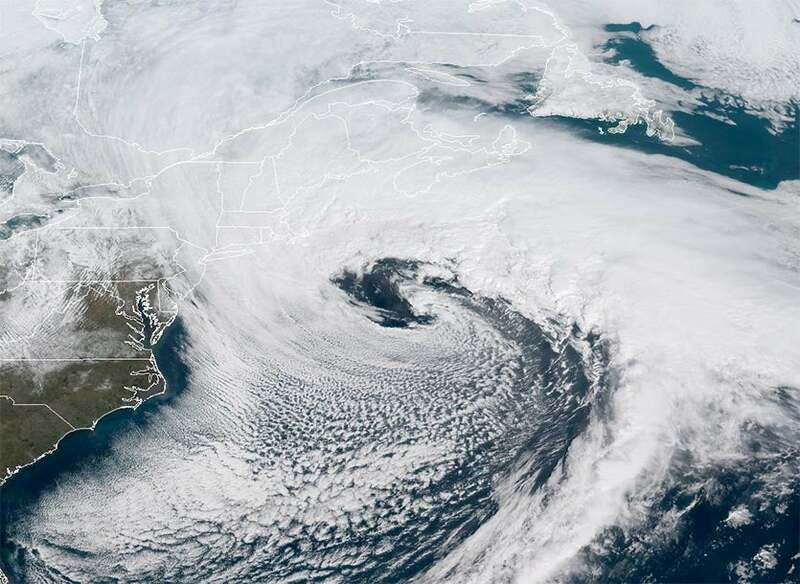 The low-level circulation of the storm, dubbed Skylar by The Weather Channel, was pumping fierce winds across New England. By 11 am EST Tuesday, blizzard conditions had already been confirmed at Hyannis, Falmouth, and Plymouth, MA. (The NWS definition of a blizzard is “sustained winds or frequent gusts of at least 35 mph and considerable falling and/or blowing snow frequently reducing visibility below ¼ mile for at least three hours.) As of 10 pm EDT Tuesday, Skylar had brought wind gusts as high as 81 mph to East Falmouth, MA; 79 mph at the Hyannis airport; and 77 mph on Nantucket Island, where 99% of customers were without power on Monday night. Figure 1. GOES-16 satellite image of Winter Storm Skylar, taken at 11:00 am EDT Tuesday, March 13, 2018. 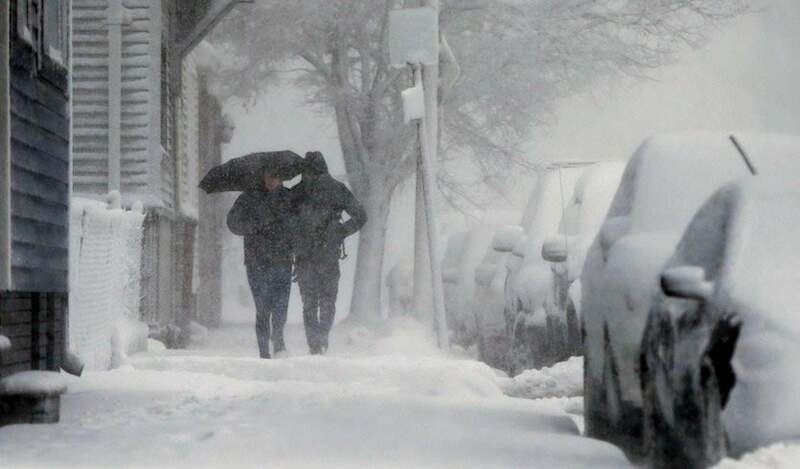 The huge storm covered most of the Northwestern Atlantic, and was bringing heavy snow and near-hurricane-force wind gusts to Eastern Massachusetts. 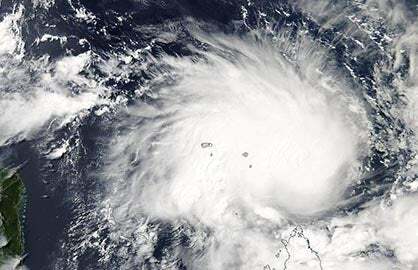 Image credit: NOAA. Figure 2. Predicted precipitation (colors) and lines of constant pressure (black lines) valid at 2 pm EDT (18Z) Tuesday, March 20, 2018, from the 2 am EDT (6Z) Tuesday, March 13 run of the GFS model. A coastal storm is predicted to bring heavy rain and snow, plus strong winds, to the Mid-Atlantic coast. 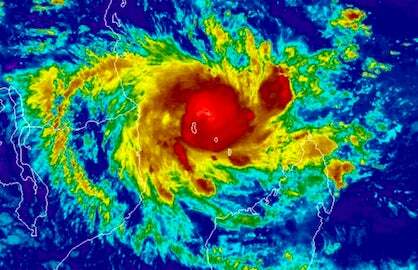 Image credit: Levi Cowan, tropicaltidbits.com. 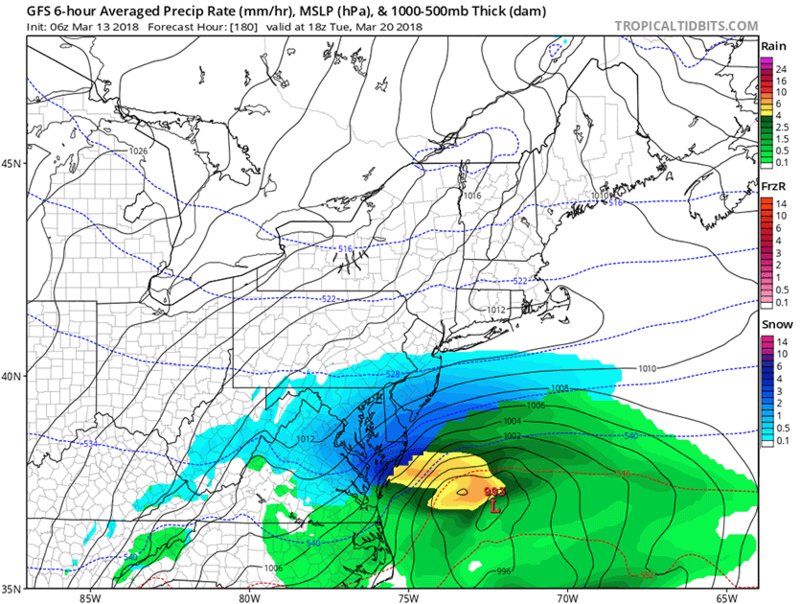 Our top weather forecasting models--the GFS and European models--have been predicting in recent runs that yet another coastal storm will impact the Northeast and Mid-Atlantic U.S. next week, in the Tuesday – Thursday timeframe. While the latest runs of these models did not show a “bomb” cyclone with major impacts to the coast next week, it is too early to be confident of this. Next week’s storm has the potential to be a nor’easter that will bring heavy rain and snow and strong winds. And with astronomical tides expected to be about 1.5’ higher next week than this week due to the phase of the moon, the potential for a damaging storm surge is higher. In the case of the winter of 2018, our active storm pattern was likely influenced by a record-strong phase of the Madden-Julian Oscillation in the tropical Pacific in January, which in turn fed into a split of the stratospheric polar vortex in February. The atmospheric reverberations of the split are still being felt, e.g., in unusually cold temperatures across much of Europe and Asia. Figure 3. 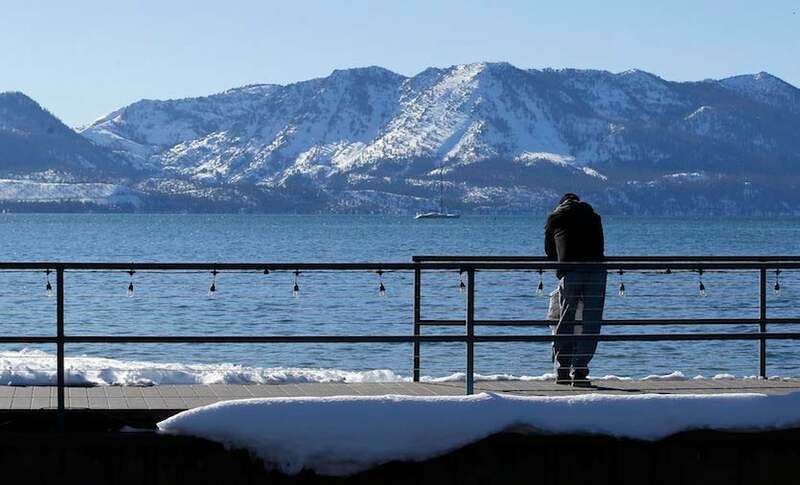 Snow covers mountaintops overlooking Lake Tahoe on Monday, March 5, 2018, in South Lake Tahoe, Calif. A welcome late-winter storm at the beginning of March still left the state with less than half the usual snow for this late point in the state's important rain and snow season. Image credit: AP Photo/Rich Pedroncelli. At the other end of the United States, an upcoming series of winter storms will be more than welcome. California’s Sierra Nevada­—which supplies more than 60% of the state’s developed water supply—has racked up far less than its usual quotient of precipitation for the wet season that began on Oct. 1. The amount of water held in Sierra snowpack was running at just 36% of the normal value for the date as of Tuesday, March 13. Moisture has been even skimpier in Southern California. Downtown Los Angeles racked up only 3.01” of rain from October 1 to March 12, its fourth driest such period in records going all the way back to 1878. 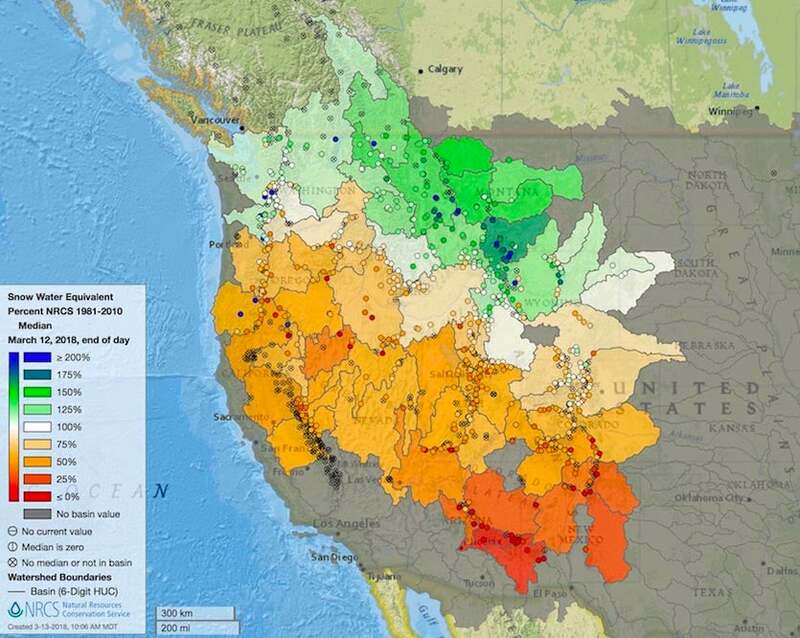 The Sierra’s water supply will get a big boost from an imminent sequence of winter storms. One burst of snow will arrive Tuesday into Wednesday, and another should extend from Thursday into Saturday. The Tuesday-Wednesday storm alone could produce 12” or more of snow above 4000 feet, with up to three feet possible in favored spots. Even bigger totals are possible in the late-week storm. Another strong upper-level low will take up residence west of the California coast early next week; it’s too soon to know whether that one will end up plowing into the coast or lingering offshore. Mandatory evacuation orders were once again in place on Tuesday in parts of Santa Barbara County, as the incoming storm could produce flash flooding near hillsides scorched by the fires of December 2017. A flash flood watch was in effect Tuesday for the Thomas, Wittier, Sherpa, and Alamo burn areas. Beyond California, snowpack for the winter is well below average throughout most of the U.S. West roughly south of a line from Portland, Oregon, to Casper, Wyoming (see Figure 4 below). The shortfalls are most severe in the southern Rockies, home of the critical Upper Colorado River watershed that feeds into Lake Powell and Lake Mead. Figure 4. Snow water equivalent (the amount of moisture held in snowpack) as of Monday, March 12, 2018, as derived from 980 stations across the U.S. and Canadian West. The values shown are percentages of the median winter snowpack recorded on this date during the climatological period 1981-2010. Image credit: USDA/NRCS and National Water and Climate Center.